Viacom (NASDAQ:VIA,VIAB) unquestionably is cheap. The B shares of Viacom stock trade at barely seven times 2018 consensus EPS estimates. VIAB stock also has an attractive 2.76% dividend yield. But the question is whether it’s cheap enough – and I’m still skeptical about that. In February, with VIAB stock at $34, I argued that investors should take the money and run. This summer, with Viacom stock at $29, I argued that investors should buy CBS Corporation (NYSE:CBS,CBS.A) instead. With CBS a long-rumored acquirer of Viacom – both companies are controlled by Shari Redstone and her National Amusements company – CBS offered potential ownership of Viacom if a deal went through, and CBS stock would rise if the transaction collapsed. The latter scenario appears to be what has happened this week. CBS CEO Les Moonves is out. That would seem to be bad news for CBS stock, and it may be good news for Viacom stock, given Moonves’ long-held opposition to a merger. But CBS rose nearly 6% on Thursday and Friday combined, while Viacom stock dropped nearly 2% over those two sessions, continuing a 10%+ pullback from its mid-August levels. There are good reasons why Viacom stock is dropping and why it remains so cheap. Those reasons are enough to stay on the sidelines, at least until the company’s underlying business shows improvement. Following sexual harassment allegations against Moonves, the CEO is departing CBS, the company announced on Sunday evening. But the deal goes further. That’s not good news for Viacom stock. CNBC reported back in May that the two companies had agreed on an exchange ratio of 0.6135 CBS shares for every share of VIAB stock. That ratio would have valued the B shares at about $32, representing over 10% upside from current levels. It also would have enabled Viacom to escape its stretched balance sheet. 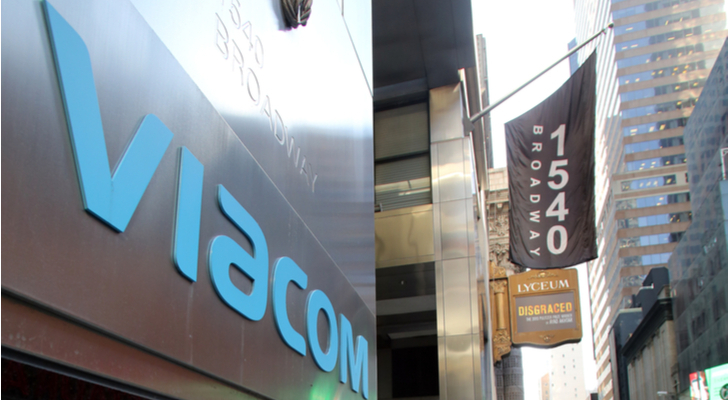 Viacom closed its fiscal third quarter with just over $10 billion in debt. That equates to more than three times its trailing twelve-month EBITDA. The combination of substantial indebtedness and declining profits always is a dangerous one, and Viacom now has to manage those risks on its own until at least 2020. In short, the loss of Moonves might wind up being a positive for CBS stock, at least in the medium term. But it’s no doubt a negative for Viacom, which could have obtained more breathing room for its turnaround. It also could have potentially realized some synergies that would have offset its profit declines. As a standalone company, however, there is a case for VIAB stock. In fact, Barron’s made that case on Sunday. Viacom is showing signs of a turnaround under its CEO, Robert Bakish. The conglomerate’s Paramount Pictures division is reversing from a money-loser to a potential source of profit. Nickelodeon and MTV – both of which have struggled for years – are showing signs of life. As Barron’s columnist Jack Hough pointed out, the company is reviving successful franchises. Nickelodeon is rebooting Rugrats, while a reborn Jersey Shore has been a hit for MTV. And VIAB stock (which is far preferable to the more expensive VIA shares that trade at an illogical premium) admittedly isn’t the worst stock in the market. It is cheap. The company’s debt load is a modest concern, but Viacom’s bonds still trade at a yield to maturity under 6%, suggesting that it has little risk of going bankrupt. The TV stations business has benefited from improving subscriber trends. Viacom is projecting that its affiliate revenue (payments from cable, satellite, and live streaming operators) will increase next quarter after several quarters of year-over-year declines. The stations’ ratings are up, helping ad sales. There is a case for buying Viacom stock here. But it’s not as if VIAB is that cheap in the context of the challenge from streaming operators like Netflix (NASDAQ:NFLX) and Amazon (NASDAQ:AMZN). AMC Networks (NASDAQ:AMCX) trades at similar valuations. AMC is performing better this year, with modest profit growth, and is a more logical acquisition target going forward. CBS has said it is benefiting from cord-cutting – and it trades at less than ten times analysts’ forward earnings per share estimate. Media stocks in general are cheap, particularly those that are exposed to the cable and satellite businesses. And even with Viacom stock pulling back, it’s tough to argue that it’s the best play. AMCX is performing better, and CBS looks far better positioned, even with its successful CEO exiting. Viacom already has seen some success with its turnaround, but its profits are still declining. If an investor thinks that content has more value than the market realizes, there are better plays out there. If she doesn’t, Viacom stock makes little sense, even at a cheap multiple. Viacom is doing better, but its profits are still declining. And without CBS, Viacom still has a lot of work left to do. As of this writing, Vince Martin is long shares of CBS Corporation, and has no positions in any other securities mentioned. Article printed from InvestorPlace Media, https://investorplace.com/2018/09/viacom-stock-cheap-enough-on-own/.